30-minute WA special Christmas in Perth screens tonight at 7.30pm on Nine Perth, with Rebecca Johns, Scherri-Lee Biggs, Kate Mac and Ross Wallman. Join host Rebecca Johns as she explores Christmas in the city and beyond, including the best places to buy presents for the whole family and a little something for yourself. 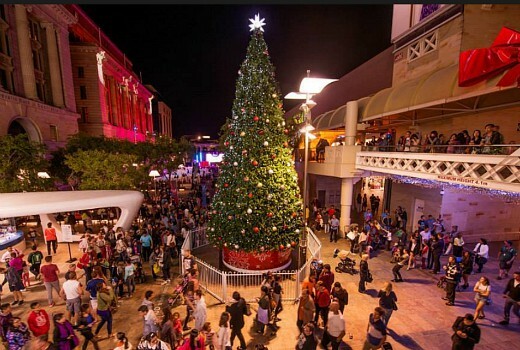 In the lead-up to Christmas the Perth CBD will come to life with the Christmas Lights Trail and 18 dazzling installations making the city shine bright – along with vibrant decorations to light up the night and a choice of two mapped trails to explore. Scherri-Lee Biggs ventures out to the suburbs to follow the Synergy Lights Trail where you can plan your own lights journey online. She meets one family who are giving something back to the community by helping those with special needs, holding a “sensory night” where every child can experience the joy of Christmas and meet Santa. Kate Mac checks out the latest summer fashions in the city and the new trends in hairstyling, which will be turning heads wherever you go. Christmas is not complete without festive feasting, so Ross Wallman checks out one of the newest restaurants in the CBD, Garum. The special Christmas menu is set to have you salivating with its Ancient Roman cooking theme with a contemporary twist. 7:30pm Thursday on Nine Perth.